I mentioned in a recent blog having a large anthology of poems in my head – ‘by heart’ as we say – memorized long ago, when I was young and tended to retain any poem admired enough to be read and re-read. One that got fixed there when I was 14 or 15 is Keats’s ‘Ode to a Nightingale’. A use I put these poems to is to get myself to sleep if I have woken in the small hours with a set of thoughts, problems, anxieties, which go around and around, and won’t let go, or let me go. I resort then to one of those many remembered poems, letting it loose like a guard dog to take up, engage, occupy the part of the brain that can’t otherwise be made to give up its wake-making hold on me. It doesn’t usually take more than two substantial poems (often one is enough) to get me back to sleep. This may not suggest a very attentive way of ‘reading’ poetry, but in fact these are poems I know better than any others. One becomes very aware of form, especially of the rhyme-scheme, which offers handholds for memory – and the hesitations and rechecking for correctness mean also a fuller awareness of the poem line by line, phrase by phrase, even word by word. Keats may have said, did say, that poetry should come ‘as naturally as the leaves to the tree’; and no doubt when he was at the top of his form, as he is in the nightingale ode, that is how it arrived for him – the mind working in high gear, so quickly that there seemed neither time nor need for calculation. It is what poets (some poets, not all) through the ages have called – often mocked by academics and other prosifiers, who don’t believe them – ‘inspiration’; and in that state the poem could seem simply to ‘arrive’, even to arrive in tight verse forms. It’s not that there is no ‘work’; only that the work is so rapid and effortless it feels like something given from outside, from beyond. The nightingale ode is eight 10-line stanzas, iambic pentameters, except for the eighth line of each stanza which is an iambic trimeter – and the whole rhyming ababcdecde. There’s a lot in it about escaping from the horrors of the real world, in which Keats’s brother was dying of the disease, tuberculosis, that would in turn take him. These imagined escapes are by means of drink or drugs; but ultimately through beauty itself, the song of the nightingale, which I had never heard until recently, sitting out in my daughter’s London garden, in fact in Queen’s Park, not too far from Hampstead where Keats heard it and wrote his ode. One of my daughter’s friends, a well-equipped modern young woman, whipped out her cell phone and recorded it. Keats begins with ‘a drowsy numbness’, as if he’d taken hemlock, or ‘some dull opiate’. But the drug is only an ‘as if’. His mood is a response to the bird-song, ‘being too happy’ in the happiness of the bird. He asks for ‘a beaker full of the warm south’, so he can escape from those things which ‘thou among the leaves hast never known’ – the sad reality ‘where youth grows pale, and spectre-thin, and dies’, and where beauty cannot last. In the fourth stanza it is not Bacchus that is carrying him away but poetry itself. And now we are on the brink of the miracle: two of the most beautiful stanzas ever written in English. Stanza 5 describes the garden or wood that can’t be seen in the darkness but can be so vividly imagined while the nightingale sings. I remember coming on a passage in Shakespeare (possibly in A midsummer night’s dream) which had clearly influenced these lines; and in Wordsworth’s poem ‘Michael’, on the line ‘Murmur as with the sound of summer flies’ to which the last line here owes so much. That is as it should be. (It’s called literary history!) Poets speak through one another. As T.S. Eliot puts it, ‘Good poets borrow, great poets steal.’ Here is the thief Keats, not merely stealing from Wordsworth, but improving on him. These were the lines which captured me completely at the age of 15, even though I was not sure I understood them. He wants to die – that’s clear – yielding somehow to the principle of Beauty represented by the song. But part of the magic and the mystery is in the conjunction of sounds: ‘thy high requiem’ – those three words sing together; but so do ‘requiem become’. And then ‘a sod’ is so final, such a shutting of the door of the grave on the mystery of the song. This, the seventh stanza, ends in the word ‘forlorn’, which is the sign-post back to the present and its sad reality. The last stanza may be mechanics, contrivance, but it serves its purpose. Another poem I have by heart is Coleridge’s ‘Kubla Khan’ which I have sometimes thought the finest lyric poem in English – though Coleridge was so uncertain of it he had to be encouraged by Byron to publish it. It had come to him in a dream brought on by opium and reading the 17th century travel writer, Samuel Purchas. He seemed to believe he was writing a narrative poem, and that the interruption of its composition by a visitor (the famous ‘Man from Porlock’) had caused him to lose not just the thread, but the inspiration, and the poem. That sunny dome, those caves of ice! His flashing eyes! his floating hair! The poem has in effect enacted itself, and nothing is lost. It has risen, like the sacred river; has flowed a given distance, and then sunk away; and finally reflected on its own magical occurrence, and on the sense of loss that, like all good things, it has come to an end. With tongues all loudness, and with eyes all mirth. With a friend like that, who would need enemies? I have been re-reading an extraordinary poem by Andrew Johnston, ‘The Sunflower’. It’s an elegy, for his father, quite a complex poem in 12 line stanzas, with intermittent rhyming. To me it is very clear in its broad meaning, and less than clear in its detail – a good combination of elements because one does not feel that one or three readings have done with it; that it has been used, and used up. It is full of sadness and reverence but is also a celebration. It contain different understandings of life (‘your god to us is dead’) and of death and what does or does not follow, as if we have been offered a glimpse of a family divided on the Big Questions, but not fatally, or even sadly divided – as if the divisions were agreed upon, and set aside as matters to be resolved later, or never. which reads like a dark joke, and yet a statement of fact. How else is it possible to know you’ve been wrong on such matters than by finding yourself in the afterlife you denied? And it’s not as if in the non-believing poet’s experience there is nothing numinous. There is the sunflower, and something like a moment of vision on a cross-channel ferry, when ‘fatigue’s mysterious flower spoke perhaps in tongues’. What strikes me most about this 150 line poem (12 x 12 + 6) is the perfect tone and pitch. It has reverence without sounding churchy or false. The intellect is constantly at work , arguing with itself, trying to make sense of the puzzle of life’s presence and then its absence; asking the questions that usually come too late. In my last three years as Professor of English at the University of Auckland I ran a creative writing course (the University’s first) and Andrew Johnston was a member. So were Greg O’Brien, Chris Price and Tim Wilson, all well-known now, any or all of whom (with others less well-known) I may write about in a later blog. L-R: Andrew Johnston, Tim Wilson, Hugh Stevens, Ross Lay, 1985. Photo by C.K. Stead. Andrew, who now lives and works as a journalist in Paris, can be seen on the left of the picture above. Behind him, with enormous hair, long tan boots and tasselled jeans, is Tim, who became known as a TV presenter, and has emerged more recently as a fiction writer. Sitting on the couch is Hugh Stevens, who went on to do a PhD at Cambridge that became a book about Henry James. He taught at York, and then at University College London, where he is now a senior lecturer. 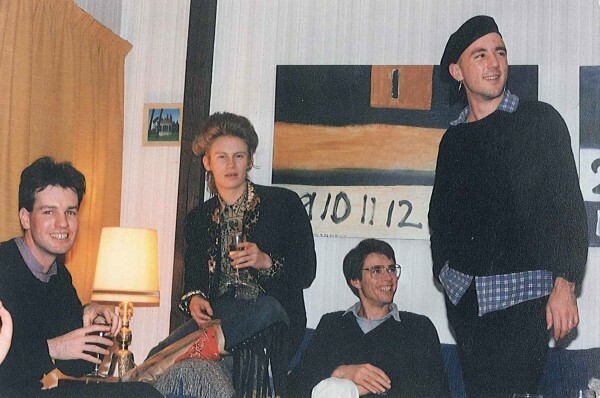 The one standing, wearing a beret, is Ross Lay, a talented young poet at the time who has since disappeared from my radar. In the background is one of Colin McCahon’s ‘Rocks in the Sky’ series, which I regret to say I later sold. What surprises me most about a picture like that is to reflect that these, whom I continue to think of as young, are now the age I was when I was their professor. Johnson’s poem ‘The Sunflower’ can be found in his 2007 Collection, SOL published by V.U.P. An earlier collection, The Open Window, was published in the U.K. by Arc in 1999. Left laughing and tugging his forelock. Thank you, Karl, for taking us back to Keats’ ‘Nightingale’ ode. It is good to be reminded of what has made memorable verse when some of what gets published at present reads like chopped-up chatter, hardly even ‘prose’. For me, a large part of Keats’ magic is the patterns of sounds that speak what he is experiencing (actually or in his mind). In stanza 6, for example, with the line ‘While thou art pouring forth thy soul abroad’: the long vowels and diphthongs of though, pouring, forth, soul and abroad, which seem to voice the nightingale’s ‘full-throated ease’. The repetition of ‘Forlorn!’ to open the last stanza, excitingly suggests that Keats was tracking his own experience and listening to what he’d been writing, to discover now how his poem would move to its conclusion. But the magic continues, as we follow with him the fleeing bird-song ‘Past the near meadows, over the still stream, / Up the hill-side…’. It looks so easy! One small niggle: to my ear, ‘abroad’ and ‘sod’ are not-quite rhymes. Did Keats, I wonder, say them as ‘abrod’, or ‘sawed’? Pointless to question, though, when ‘sod’ sounds dead right. Very glad there's someone out there reading these blogs, and especially pleased it should be someone as ear-sensitive as Alan Roddick. As for abroad and sod - I hadn't noticed how imperfect it is as a rhyme - unless of course, as Alan says, Keats pronounced abroad as abrod, or sod as sawed. It was said Keats was one of 'the Cockney school' - but did that mean a Cockney accent? I seem to remember that Yeats refers to him as 'low-born' but that's more a reflection of Yeats's snobbery than of anything else; and in any case, how would it affect his speech? One doesn't know.